For many people, the main thing holding them back from cooking at home is the fear of learning how. Here at the Sargent Choice Nutrition Center we want to help you get over this fear by equiping you with some cooking basics. Once you’ve mastered these, you’ll be amazed at how non-threatening most recipes will become — you may even find a passion for cooking! Eggs are a wonderfully healthful food; full of protein, vitamins and minerals to keep you satiated. They are also cheap, easy-to-prepare, and taste great. Yet for all their simplicity, many of us can botch up a simple scrambled egg. From hard-boiled to the classic omelet, here are the basics to cooking an egg, sans complexity. 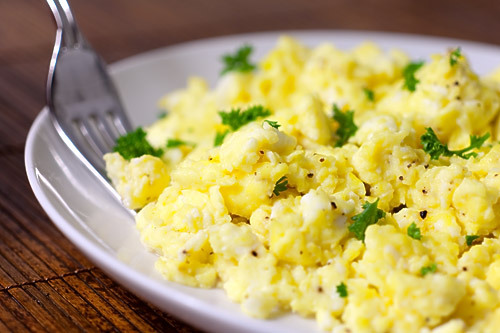 Scrambled Eggs: Take one or two eggs and whisk them together until even-colored and frothy. The more air you whisk in, the fluffier your eggs will be. You can add 1 Tbsp of milk for each egg and salt and pepper to taste. Heat 2 teaspoons of oil at medium heat in a skillet and pour in the eggs. Turn and fold gently until liquid is set. * A lot of people have associate “fried” with an unhealthy level of fat. This is NOT true in the case of fried eggs! 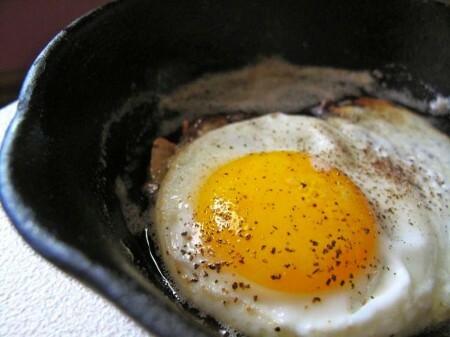 When prepared correctly, fried eggs typically have very little oil or fat. Poached Eggs: Boil at least 3 inches of water in a saucepan and crack an egg into a cup. Gently slide the egg into the boiling water. You can use a spoon to nudge the whites closer to the yolk. Allow the eggs to cook for 3-5 minutes. Remove with a slotted spoon. Hardboiled: Place eggs into a large pot and fill with water until eggs are covered by one inch. Bring water to a slow boil over medium heat and allow eggs to simmer for 1 minute. Remove from heat, cover, and allow eggs to sit for 10-12 minutes. Carefully remove eggs and rinse under cold running water. Allow eggs to cool before peeling. Classic Omelet: For a two-egg omelet, whisk eggs with 2 tbsp of water and a dash of salt and pepper. Heat a teaspoon of oil in a skillet and pour the mixture in. Push the edges of the eggs towards the center until all the uncooked egg becomes solidified. To add vegetables or low-fat cheese, place them on one half of the eggs, and fold over the other half. * Be creative with vegetable additions! The most popular choices are tomatoes, onions, bell peppers, spinach, and mushrooms. of the washed spinach in pan until spinach wilts and then add in remaining spinach. Cook for approximately 3 minutes, stirring several times. Cover and set aside. teaspoon of chopped dill and whisk until all the ingredients are thoroughly blended. Cook approximately 1 minute until sauce is warmed, remove from heat. remaining chopped dill (and black pepper, optional). *Special thanks to Dietetic Intern Sandy Klemmer & Executive Chef Chris Bee for creating this delicious recipe! Type Cooking Time Tips Portable?